When I was 18, I was naïve about many things. Prominent among those things was how to behave around girls. While most boys were busy learning the social rules, I blundered along in my ignorance. So the day when a pretty girl in my grade offered to give me a back rub, with my shirt off, I accepted without reading anything into it. Sometimes a back rub is just a back rub. She had me lay face down and, using some lotion, she began the massage. Honestly, I wasn’t enjoying it much. I was having trouble relaxing as I wondered what to say when she was done. I’d had better massages before and I’ve had better since. I decided that I should just be honest. “How was that?” she asked as she sat back. “Okay? !” she said, with a look of amused surprise, and perhaps a trace of hurt. In hindsight, I should have lied. I should’ve said it was great, fantastic even. Anything but what I said. But I said what I was thinking. And I’ve regretted it for decades. I guess that, sometimes, honesty is not the best policy. Just to be clear, I’m not advocating deliberate deceitfulness. I’ve been around enough liars and truth-benders to know that it’s never a sustainable way to be. What I want to consider instead is the value of sticking to unvarnished honesty at all costs. Perhaps there is room for a place that exists somewhere between a hurtful lie and the brutal truth. My dictionary defines honesty as “truthfulness” and truth as “honesty,” but perhaps it’s not as simple as all that. Gandhi understood that there exists a distinction between truth and full disclosure. “Who can say how much I must give and how much omit in the interests of truth?” he wrote in his Autobiography. To focus overly much on bald-faced honesty ignores that there are more subtle forces involved. The Biblical Ten Commandments include the following: “You shall not give false testimony against your neighbor.” All my life, this has been interpreted for me as “never lie.” Strictly speaking, this would require unvarnished honesty at all times. Under this scheme, the so-called “white lie” is still a lie and should not be tolerated. Technically, though, the commandment is less universal than that, requiring only that no “false witness” be used against your “neighbor.” What about when talking with your husband or wife, for instance? If you tell them you are happy to be married in a moment when you are not entirely convinced of the truth of that statement, is that false witness? What about with your child? When you tell them their popsicle stick collage “art” is beautiful, is that false witness? 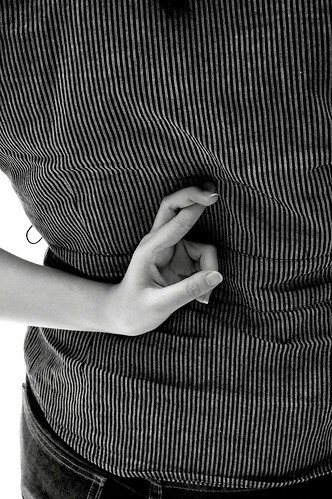 Maybe an occasional dishonesty is okay, even in the eyes of God. In the farcical movie Liar, Liar (1997), Jim Carrey plays a man condemned to always tell the truth. Quickly, it becomes apparent that all honesty all the time leads to awkward situations and hurt feelings. Even when people say “be honest” they often don’t mean, literally, honest. The story implies that a little dishonesty once in a while acts as a type of social lubricant, easing the friction of our daily lives. Take that away and we are faced with the loss of a measure of civility. Does this suggest that we will all descend down the slippery slope as we abandon honesty? I don’t think so for a few reasons. For one, with the exception of young children and those with mental health problems, people normally understand when a small lie cross the line into more sinister territory. As long as we have some kind of value system, we can maintain a distinction between the two. For another, many people frequently find themselves in situations where they feel they have to “fake it.” As the author Susan Cain points out in her book Quiet, this is often true for introverts. It also can be true for those stuck in an unsatisfying line of work or difficult family situation. The trick is not mistaking a surface level of feeling false for a deeper-rooted inauthenticity. The inner compass should remain true, despite of moments of uncertainty.